A Small Bowel Follow Through uses X-rays (fluoroscopy) to produce a real-time image of the first part of the intestines. A Small Bowel Follow Through radiology procedure focuses on the small intestines (duodenum, jejunum and ileum). Why is the Small Bowel Follow Through radiology procedure Performed? The procedure is also performed following surgery in the abdomen. There are currently no alternatives to a Small Bowel Follow Through radiology procedure. There are no recent advances to Small Bowel Follow Through radiology procedure. What is the Cost of performing the Abdominal X-ray radiology procedure? The cost of a Small Bowel Follow Through procedure depends on a variety of factors, such as the type of your health insurance, annual deductibles, co-pay requirements, out-of-network and in-network of your healthcare providers and healthcare facilities. How does the Small Bowel Follow Through radiology procedure work? How is the Small Bowel Follow Through radiology procedure Performed? A Small Bowel Follow-Through Exam is performed as an inpatient or outpatient procedure at a hospital, depending on the indication (or cause for performing the procedure). A Small Bowel Follow Through radiology procedure is performed by a radiologist or a radiology technologist under the supervision of a radiologist. The duration of the Small Bowel Follow Through radiology procedure varies, but commonly takes up to 2 hours, to capture images of the entire small intestine. Typically, a radiologist interprets the series of images and informs the physician who will convey the results to the patient. A physician will request your consent for the Small Bowel Follow Through procedure using an Informed Consent Form. What are the Limitations of the Small Bowel Follow Through radiology procedure? Using the images obtained, small masses or areas of narrowing may be difficult to spot and may be missed. What is a Small Bowel Follow Through procedure? What is expected during the Small Bowel Follow Through radiology procedure? No anesthesia is administered during a Small Bowel Follow Through radiology procedure. There is no blood loss during a Small Bowel Follow Through radiology procedure. What are the possible Risks and Complications during the Small Bowel Follow Through radiology procedure? What Post-Operative Care is needed at the Healthcare Facility after the Small Bowel Follow Through radiology procedure? No post-operative care is needed following a Small Bowel Follow Through radiology procedure. What is to be expected after the Small Bowel Follow Through radiology procedure? In general, there are no complications following a Small Bowel Follow Through radiology procedure. The bowel habits may be irregular (constipation or diarrhea), but should return to normalcy in 1-2 days. If there is a severe abdominal pain or fresh red blood in stool is noticed, you should contact your physician. What Post-Operative Care is needed at Home after the Small Bowel Follow Through radiology procedure? Care should be taken to drink adequate amount of fluids to avoid constipation following the procedure. Additional recovery time is not necessary following a Small Bowel Follow Through radiology procedure. The Small Bowel Follow Through radiology procedure does not involve the removal of any body tissue. 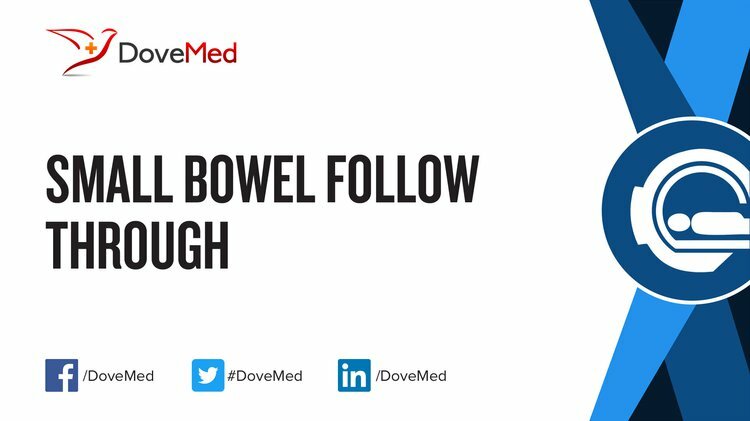 Since no tissue is removed during the Small Bowel Follow Through radiology procedure, a pathologist does not get involved in the care of the patient. Who will you receive a Bill from, after the Small Bowel Follow Through radiology procedure? The patient is advised to inquire and confirm the type of billing, before the Small Bowel Follow Through procedure is performed.